Desalination or desalting is a process by which dissolved solids/salts are removed from an influent water source. The process dates back to the 4th Century BC when the Greeks used an evaporative process to desalinate water. Reverse osmosis (RO) has become the most popular method of desalination in most regions of the world. This trend is also true of the Caribbean region although it led the world over 80 years ago in the field of thermal desalination. 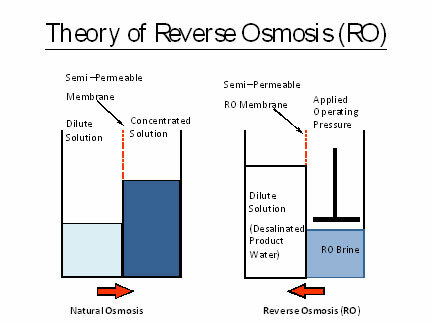 Reverse osmosis desalination is a pressurised process which uses membrane filtration technology to desalinate water. Membrane technologies were first developed in the 1960’s. Technological advances in the industry since this time has ensured significant increases in operational efficiencies and reduced plant energy consumption. The water source for treatment by the desalination process can be brackish water from ground water aquifers, surface water or seawater. The resulting product water from the RO process is suitable quality for drinking water after disinfection. Membrane processes are pressure driven operations which utilise a semi-permeable membrane to separate solutes from a solvent. Membranes types are characterised by reference to the size of particles and contaminants which they are capable of separating. Semi-permeable polymeric membrane materials such as polyamide and polysulphone are used to efficiently separate dissolved salts/ ions and harmful contaminants from a feedwater to produce a treated permeate stream. A major advantage of membrane treatment is the consistency of the product water quality produced. Reverse osmosis is capable of removing 95%-99% dissolved salts and organic material from an influent water source. 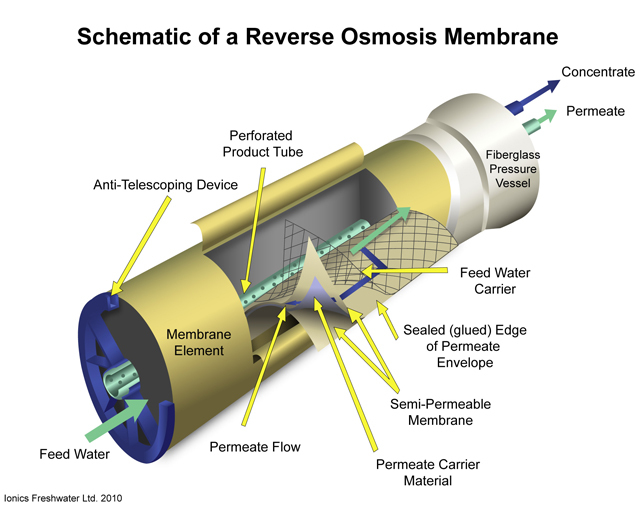 Reverse Osmosis (RO) is the primary method for desalting water and uses a spiral wound membrane format. A spiral wound element consists of a semi-permeable membrane with a mesh spacer wound around a plastic product water carrier, this is sealed in a fibreglass casing. An RO plant consists of pressure vessels containing several membrane elements in series. The RO plant design is modular and hence the number of vessels is directly related to the design capacity of the system. RO systems can be designed to treat surface water, well water or sea water. The extent of pre-treatment required is dependent on the quality of the influent feed water and also of the required product/permeate water quality. The membrane material generally used for potable water treatment applications are made from polysulphone with an ultra-thin polyamide salt rejecting layer, which provides the essential semi-permeable and salt rejecting properties. The membranes typically reject >99% of dissolved salts and all organic particles, micro-organisms and other nutrients. The cost of RO desalination was once considered prohibitive but advancements in the industry have enabled the technology to become competitive with other conventional treatment processes. WHAT HAPPENS TO DESALINATION BRINE? Brine disposal practices are regulated and monitored by local environmental protection departments. The affordability of desalination is dependent on the quality of the water source to be treated. The cost of treating a seawater source is generally higher than that for treating a brackish water supply. This is largely due to the higher quantity of dissolved salts present in seawater and the higher operating pressures required to overcome natural osmotic pressure (see ‘Theory of RO’ diagram). The decision to select desalination will depend on the need for additional water resources and would likely be one part of an integrated water management program which may also include wastewater re-use, leak detection and mains replacement. Copyright © 2019 Ionics Freshwater Ltd. All Rights Reserved.